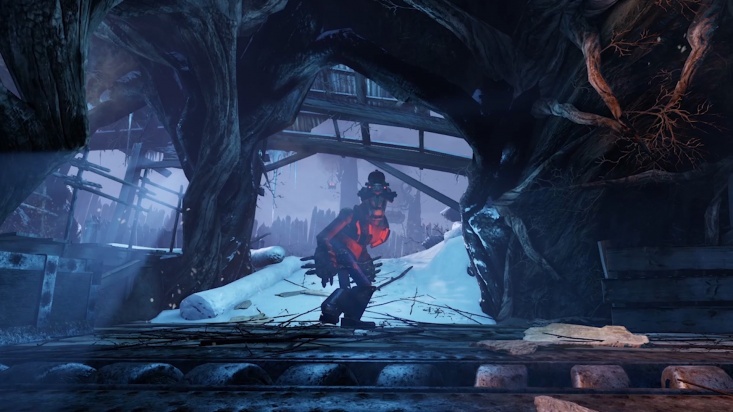 The Krampus Lair is a Killing Floor 2 map. 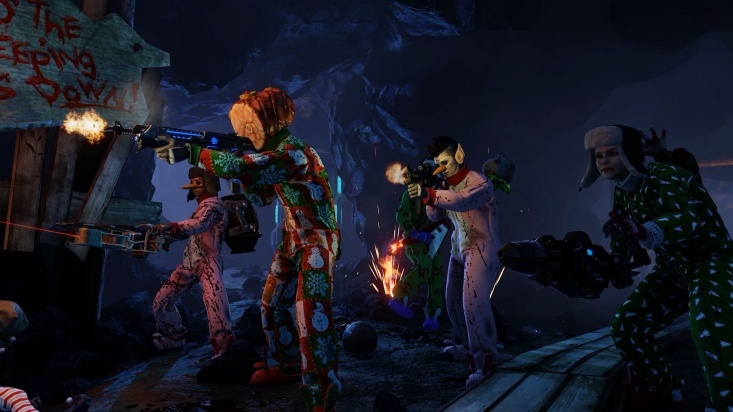 Is was added in the game as a part of Twisted Christmass 2017 update. 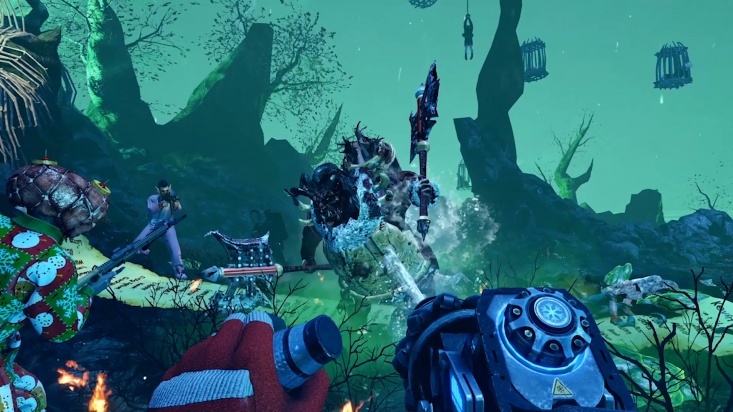 It is the Hold Out style map featuring optional "Stand Your Ground" objectives - through the waves players are offered with the optional tasks to defend certain locations of the map. Successfuly completed objectives will reward players with extra Dosh. As a part of seasonal event the Krampus Lair also featuring the optional objectives, required to obtain time-limited even-themed player outfit. 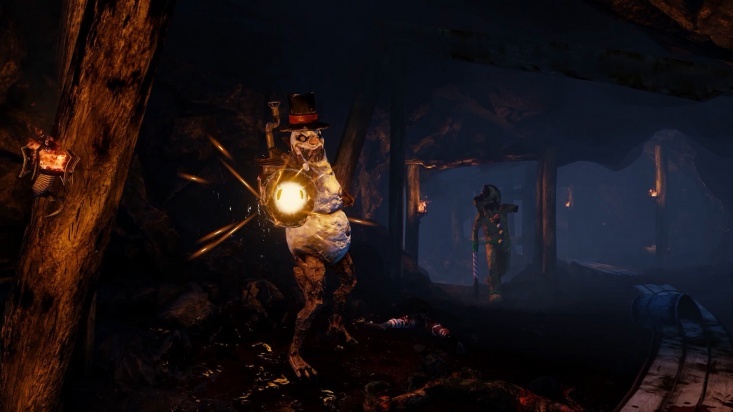 "Krampus Lair is a twisted and dark lumberyard, workshop, and prison all in one. You must fight your way through the lair and at the heart of Krampus’ operation traverse the portal to his throne room where he keeps the Naughty List. Can you save the day before your name is forever enshrined on the Naughty List? Krampus Lair will include five new objectives that can be completed for Vault Dosh and a unique event reward. Also watch out for the wood chipper. It chips people as well as wood… but people chipper just sounds weird." Break Krampus's trinkets in Krampus Lair. Kill a Zed using the wood chipper in Krampus Lair. 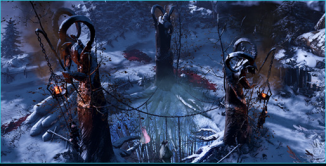 Complete the Stand Your Ground objective in Krampus Lair. Find ten of the collectibles in Krampus Lair. Kill Krampus on Hard or higher Difficulty in Krampus Lair. Hold Out style map featuring 5 main locations. Entrance (wave 1), Courtyard (Short - wave 2, Normal - wave 2-3, Long - wave 2-4), Prison (Short - wave 3, Normal - wave 4-5, Long - wave 5-7), Coal Mine (Short - wave 4, Normal - wave 6-7, Long - wave 8-10) and Krampus Lair (boss wave). Stand Your Ground objective: Starting from wave 2 with 35% chance players will be given optional tasks to defend certain locations of the map. Players will have up to 30 seconds to made their way into the marked zone before the penalty goes off. It is required certain amount of the players for marked zone to stay valid (1 player - 1, 2-3 players - 2, 4-6 players - 3). Players have to defend this zone, if certain amount of the ZEDs will be present in it, the penalty will start ticking (ZEDs needed for penalty: 1-3 players - 4, 4 players - 3, 5-6 players - 2). If zone goes into the danger state (due to either either lack of players or for too many ZEDs in it) the penalty timer will start subtracting promised dosh reward within 1 second intervals. For the "no humans" penalty the value is -10 dosh / tick, for "too many ZEDs" this value is -5 dosh / tick. The promised dosh reward (base value) itself vary from 200 to 400 depending on the Zone. Note that all the values for Dosh Hold objective are Zone-specific and are the subject of change. Trader lines related to objective depend on the dosh saved: Good - 85%, Normal - 50%, Below 25% - Bad. Chipper pit trap (push mechanism) does 5 points of damage within 0.1s intervals, knocks down ZEDs and has a lot of push force. It takes 2s to play movement animation and 2 seconds for trap to return back to its original location. Pit (blades) itself does 1000 points of damage within 1s intervals. Bonfire in the house of the Entrance area does 20 points of fire damage within 1s intervals. Doors in the Prison area are welded from the start. They have Max Weld Integrity of 700.